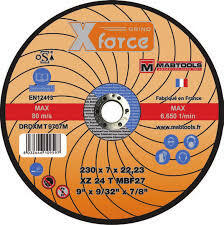 The high quality of Xforce discs provides the best results with the same product as steel and stainless steel. Xforce discs can also be used on cast iron. Main applications, maintenance, metal carpentry, metal constructions, auto service, shipyards, tanks, gas pipelines over naphtha. The main features of the Xforce Cut series are long life, high balance, high cutting efficiency and absolute safety. The Xforce series is designed for professional applications in metalworking, vending machines, tanks and pipelines, shipyards, power and food industries. High performance, perfect balance, clean and endless cut are the main advantages of Xforce cutting discs, making them the perfect choice for fast and productive work. The special blend of Xforce is free of sulfur, iron and chlorine and is produced with high quality European raw materials, corundum and zirconium, mixed resins and special fillers.